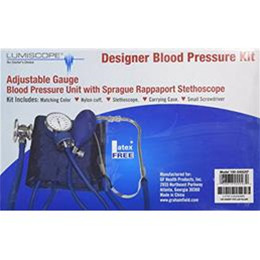 Lumiscope kit includes a blood presure unit with a nylon cuff, touch and hold closure, metal gauge with spring clip and inflation system. Professional Sprague Rappaport Style stethoscope with 22" tubing and accessory pouch that contains 2 diaphragms, 2 pair of ear tips and 3 bells. The kit includes a color matching nylon zippered case. This listing is for Purple. Also available in Hunter Green, Orchid and Pink.